I haven't posted much lately but realizing I am coming up on the one year anniversary of my trip to Texas made me get on here to finish this series up. Let's pick up where we left off. I had a goal for Day Six. As we chatted about the day and wondered where to go I was sure we should hit up Sable Palm Sanctuary. People had recommended we hit up Sabal Palm Sanctuary and the descriptions of habitat and species looked good. Sabal Palms Sanctuary is home to a large stand of old growth Sabal Palms. Locals had warned us that the birding here just wasn't as good as it used to be after the building of "The Wall." 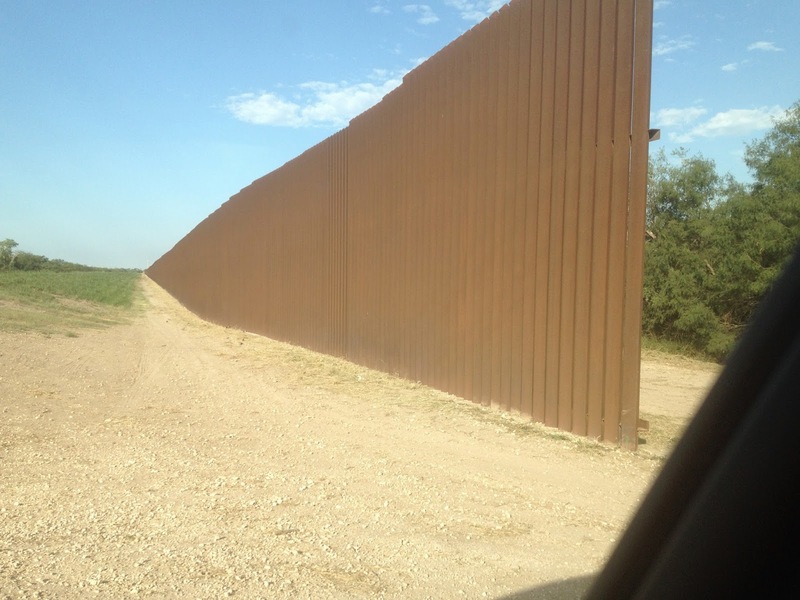 In our xenophobia we've been busy building a giant wall between parts of Mexico and Texas. It doesn't actually keep anyone out since it isn't a complete wall that covers the whole border. All it does is makes people cross somewhere else, or, you know, buy a ladder. We visited plenty of other sites along the Rio Grande where crossing the border would take nothing more than a quick short swim. We were greeted by a pair of Chichuanan ravens as soon as we drove in. This was a good sign and we were happy to see them since they are no longer hanging out at the Brownsville dump. While we did see new birds, one of the great things was to get better looks at birds we had already seen. We had previously gotten a not very good look at a Clay-colored Thrush while chasing another bird earlier in the week. It was wonderful to get such a better look. We also got a better look at the Black-crested Titmouse and White-tipped Dove. We also got a good look at a bathing Olive Sparrow. We had tried to find one earlier in the week at Estero with no luck. The highlight for me was this Yellow-throated Warbler. I was a lifer and beautiful! At some point, all of the birds disappeared from the feeders when this Red-shouldered Hawk showed up. We yet again failed to see a chachalaca though I had seen one at Sabal Palm on the webcam back in Minnesota. Oh we'll. Sabal Palm wasn't just a feeder stake out. We also explored and hiked around the site. I even happened upon a beautiful and endangered Texas Indigo Snake. There are a number of blinds set up at Sabal Palm. We didn't see a lot of species from them but I imagine at times they are great spots for seeing birds. Here, Erik is checking out the Resaca Blind. 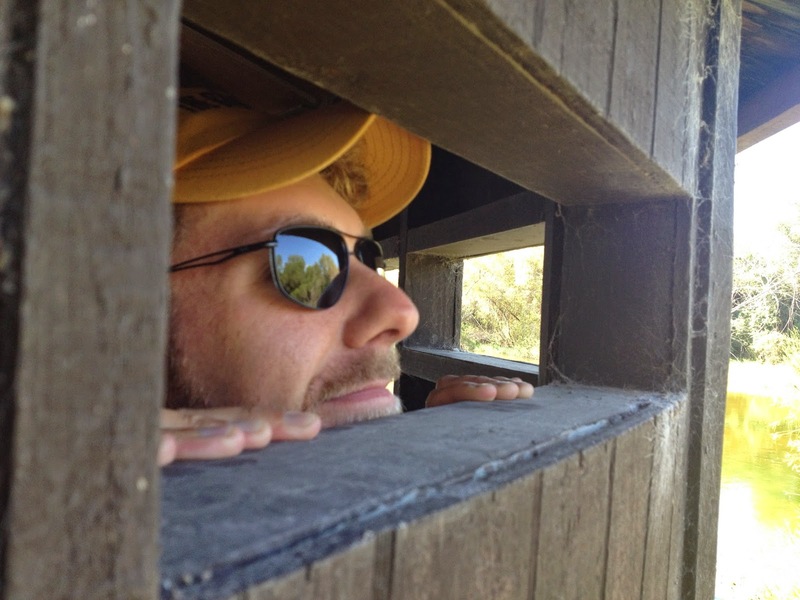 Erik was so taken with Texas that he moved down there to take a job with Quinta Mazatlan World Birding Center. 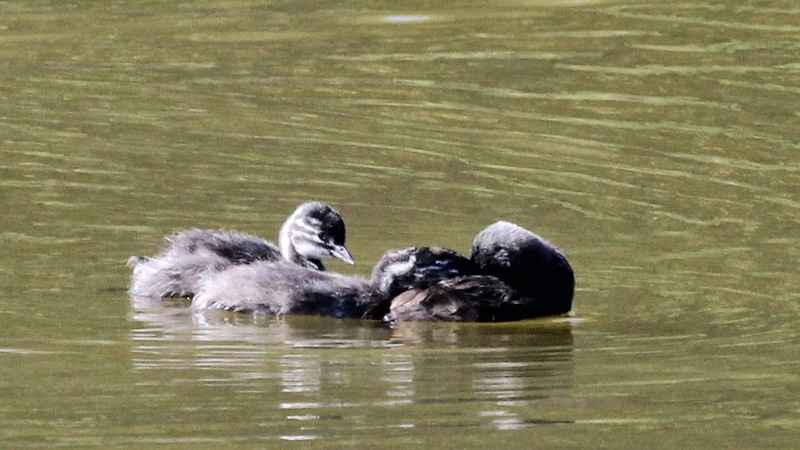 We were able to see these incredibly adorable grebe chicks from the blind. 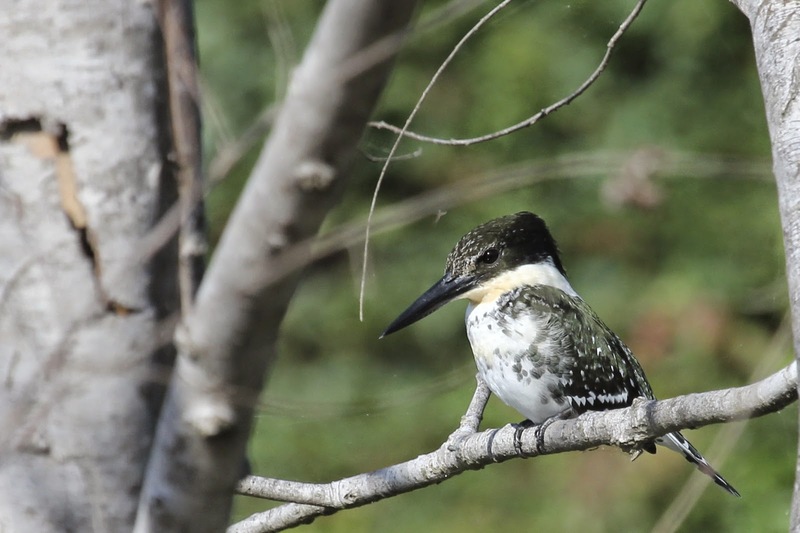 We also got good views of this Green Kingfisher from the Resaca blind. Here are the new birds for the trip I added at Sabal Palms Sanctuary. All told, we saw 35 species at Sabal Palms including the White-eyed Vireo. Everyone else on the trip had seen several of them and it was starting to be a bit of a nemesis bird for me. I kept missing them, including at a gas station while I was loading up on treats inside. There were lots of other birders at Sabal Palms on official field trips for the festival. I'm not a birding by bus kind of guy and while I'm sure the tour leaders were great and I'm sure they saw tons of birds, I much prefer to bird in a small quiet group at my own pace. We finished off Sabal Palms Sanctuary by noon and I was feeling pretty good. At this point in the week, seven new species for the trip by noon was a great accomplishment. Four of them had been lifers for me so I was even more elated. We hit up our first gas station tacos for lunch informing Kelly that her reputation was on the line since she had raved about them. They were not bad though without adding on loads of extras they were completely devoid of flavor or spice. We should not have taken advice from the one and only Texan who cannot stand spicy food. Still, you cannot argue with the speed and price. We were in, out, fed, and back on the road with a half day of birding ahead of us. Where to next? There were rumors of a Prairie Falcon hanging out north of Harlingen. Another new species anyone? It would be our sixth species of falcon for the trip and a lifer. We'd already seen Crested Caracara, American Kestrel, Merlin, Aplomado and Peregrine. What were we waiting for? We hit the roads and headed north following directions on the BirdsEye app. 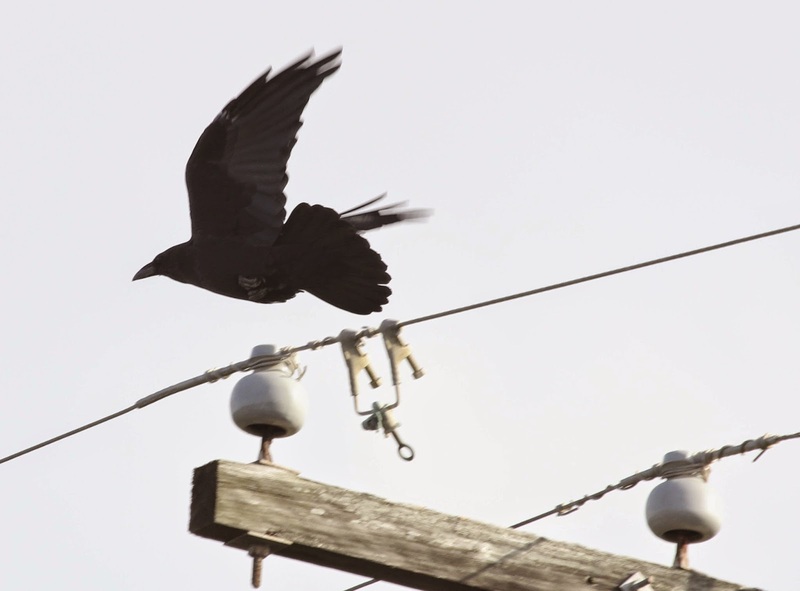 We saw lots of birds on the wires but no Prairie falcon. Kelly had caught wind that we were headed for the falcon so she drove out to intercept us and try to see it too. After a little driving around we decided to try a side road and sure enough, there was a raptor perched on the power lines. We slowly crept up and then scoped it from a safe distance. 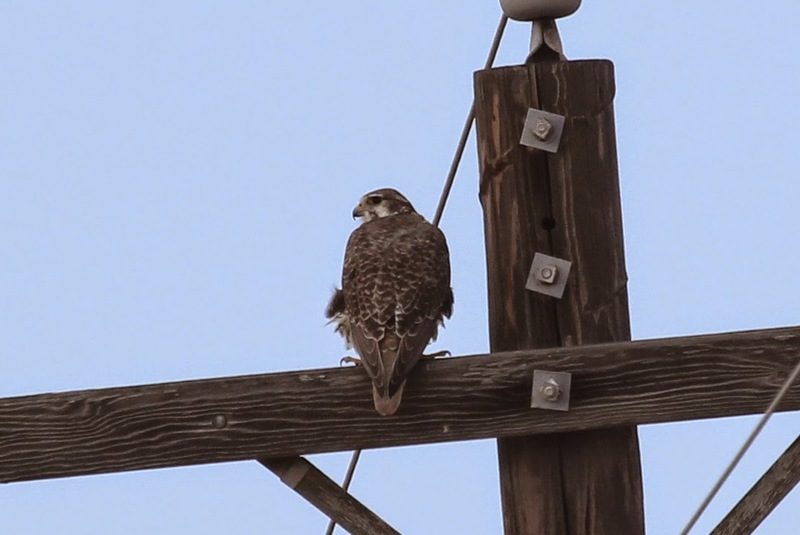 Sure enough, Prairie Falcon. What a cool bird to see. Kelly ended up pulling up behind us right as we found it and she got a look too. We found 13 other species while looking for the falcon but none of them were new for the trip. The prairie Falcon was our 145 species of bird for the trip. It had been a great day of birding but there was a problem. I'd been birding with a pair of Vortex binoculars and the hinge had developed a crack while down in Texas. It wasn't from being treated rough, it had to be a manufacturing defect. I knew of one other pair from the same batch that had developed the same crack. Since I was at the festival and knew that Vortex/Eagle Optics had a booth there I decided to swing by to see what they could do. I showed them to the rep on hand and he looked at them with interest. He had heard of this happening to a few pairs before. He flexed them back and forth a few times and then proceeded to snap them in half. He said something like, "Well, can't be using these can you?" He then reached under the table and pulled out a box with the brand new version of my binoculars and handed them over no questions asked. This is what a lifetime warranty looks like folks. I'm very happy with my binoculars and I know they will be backed up for years to come. Stay tuned for the exciting conclusion of the series. We ended with one of the greatest days of the trip. Your Red-Shouldered Hawk looks like a Cooper's Hawk to me. If I'm wrong (and I may be), can you point out what I should be looking at to help my ID? Great question! I will admit, when I put the post up, some nine or so months after these photos were taken I was relying on my eBird record for the day to remember what species we saw. We DID record this as a red-shouldered hawk so the question is why? Looking at the eyes of the bird they are yellow which indicated it is a juvenile bird so the plumage will be wrong for both an adult red-shouldered and an adult coopers. The photo really isn't the greatest. You can't get a sense of the overall size of the bird, tail length etc. What I can tell you is that when we were there and saw it in person and from a few angles everyone thought it was an immature red-shouldered. All these months later I don't recall the specifics of the ID call in the field. I'm happy to entertain other ID suggestions if you have specific field marks visible in the photo that suggest Coopers. I know the juvenile birds of both species can look similar.